"It was this desire 'to see more' that led the founders of 'The March of Time' to launch their new kind of pictorial journalism...The first issue appeared in some 400 theaters throughout the United States on February 1, 1935." The journalist who wrote this 1938 piece saw much good in theater newsreels, believing that "the newsreel encourages a keener sense of the present and imprisons it for history." He doesn't refer to any of the prominent newsreel production houses of the day, such as "Fox Movietone", "Hearst Metrotone", "Warner-Pathe" or "News of the Day" but rather prefers instead to wax poetic about the general good that newsreels perform and the services rendered. This newsreel advocate presented the reader with a long, amusing list of kings, dictators and presidents and what they thought of having their images recorded. 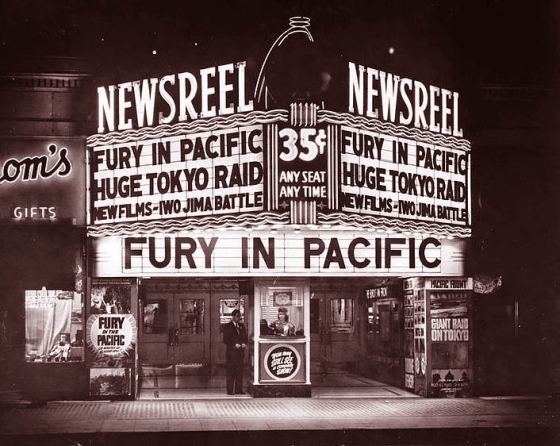 A writer warns that since the advent of sound in movies, the journalists involved in the production of newsreels had grown absolutely giddy over the possibilities of the new technology being used to bend the truth any way they wanted, and frequently did.